I am away at retreat this weekend. 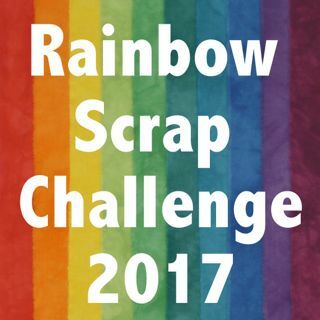 I thought I would make a post ahead of time about What is a scrap to me, and How do I sort and store the scraps. I gave a talk in Sept to my quilt guild in Leduc and some members missed it. I have two sizes of scraps. The top photo is the larger sized scraps. They tend to be smaller than a Fat Quarter but bigger than 8" square. Sometimes they are the strip off a quilt backing, long and thin. I hate to cut these down too soon. 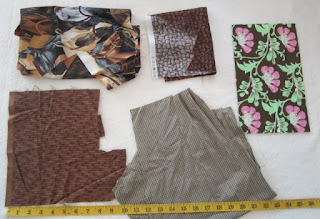 If I need a group of strips and do not have enough then I go to this basket and cut these fabrics before I go to yardage. 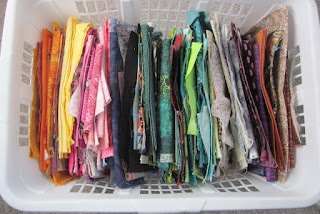 I store these large scraps in a laundry basket. I like doing this because if I left these pieces with my yardage they get lost and very wrinkly. You can see I have them sorted by colour. It looks very tidy now. This bin is not far from the cutting table. If I make a scrap I can place it here and sort it out later. If I am cutting and make lots of scrap of one colour it often goes in the colour box right a way, but if not here is sits for a few weeks. I have a few in here that do not have another home - novelty prints. I may need it's own box. 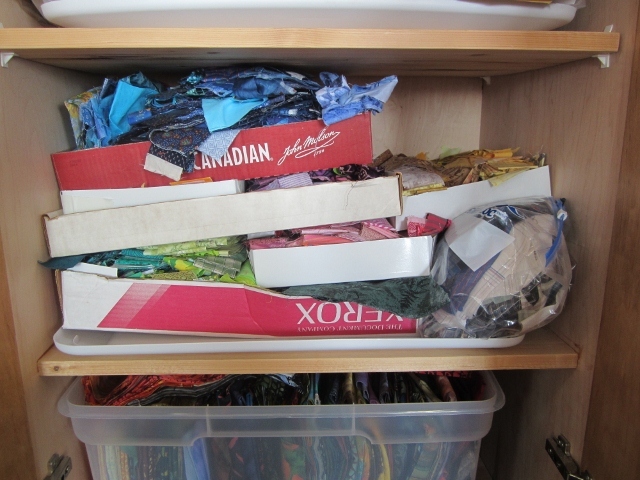 This shelf houses the boxes of colour sorted small scraps. There is a bag with plaids, but the rest is rainbow sorted. Red, pink, blue, purple, yellow, orange, and green ( lime and teals separated out) also Brown, Blacks, and neutrals. Here is the newly sorted brown box. I have packed it to take to retreat so it is in a box with a lid. When I go to use these scraps, I sometimes lay out the fabric. 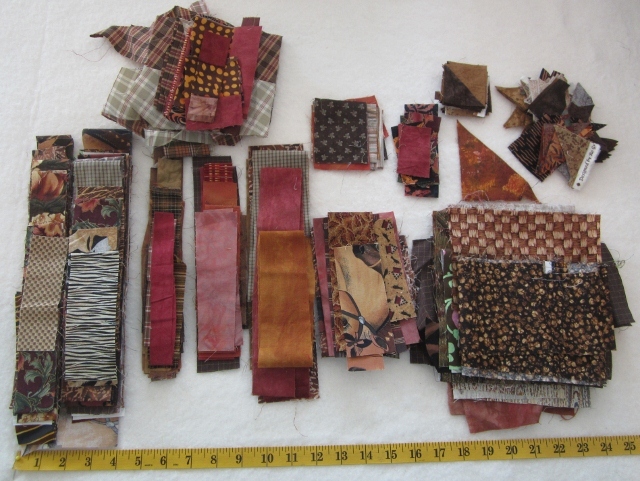 Here are the little scraps laid out. On the far left is 1 1/2" strips, then 2" then the next four rows are different sizes that did not fit. Then on the right end are pieces that are large but smaller then 8" square. The top right is chunks that are pieced some. Great start to something. The small squares and rectangles, then on far right is the triangles. Many are the end of bindings from joining then. 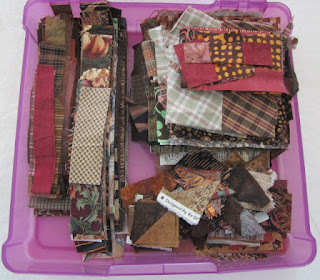 I am thinking of doing a scrap sew a long hosted by Ellison Lane. The first step is to sort my scraps by colour families. I have done that. 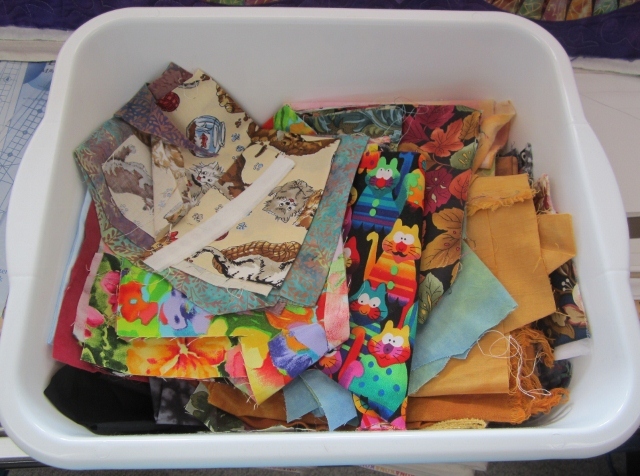 On Tuesday this week, she showed us what to do with our scraps. Improve Log cabin blocks. I have taken some with me to retreat. We will see how far I get. Using scraps does take a little more thought and organization than using yardage, but what a fun variety it leads to. Thanks for the insight on your process.